So this is what I did yesterday morning! I work with a beautiful young lady called Nadia and a few months ago she asked me to make her a ‘Snitch’ cake for her birthday. I was totally confused and looked at her quite blankly until she explained it’s a little flying ball from Harry Potter (I’m sure all you Harry Potter Fans are screaming at me right now telling me what it actually is as I’m sure my explanation isn’t too good). 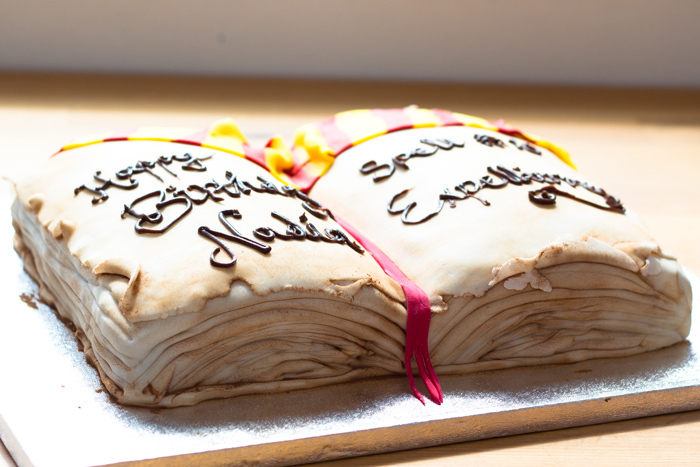 But she then decided to leave it up to me, so my brief was just to make a Harry Potter Cake for her themed party! You have probably guessed this already, but I haven’t seen any of the films in full. I’ve seen a bit here and there but I don’t know any of the details. So I had to do a lot of internet searching to find something I was happy to attempt. 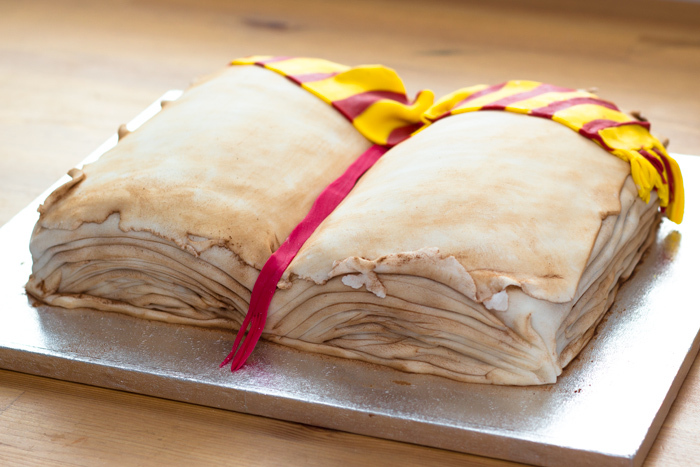 This spell book kept coming up and I thought it looked like a fun cake to make so that’s what I settled on. Nadia’s favourite cake flavour is chocolate so I made a simple tray bake chocolate cake, but you could make anything as the base for this. Once you are happy with the shape, make some frosting. 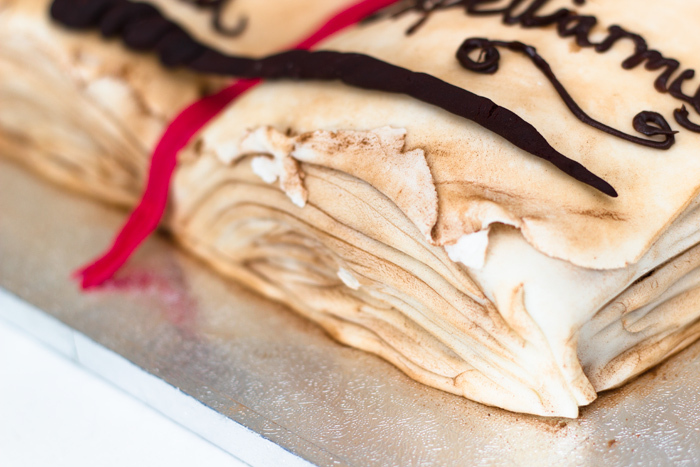 PAGES: Roll out the white fondant icing and drape over the cake. 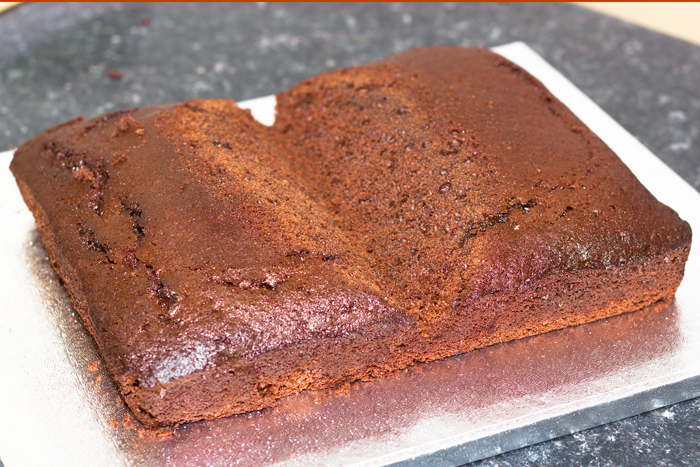 Press it into the middle of the cake to define the shape and then cut around the shape of the cake at the bottom. Brush on cocoa powder to create the ‘old’ look. I then rolled out another very thin layer of icing and placed this on the top. This means you can make the top page look more realistic by turning the pages at the corners. Brush with more cocoa powder. To make the page look along the edges just draw them in with something that’s really blunt. 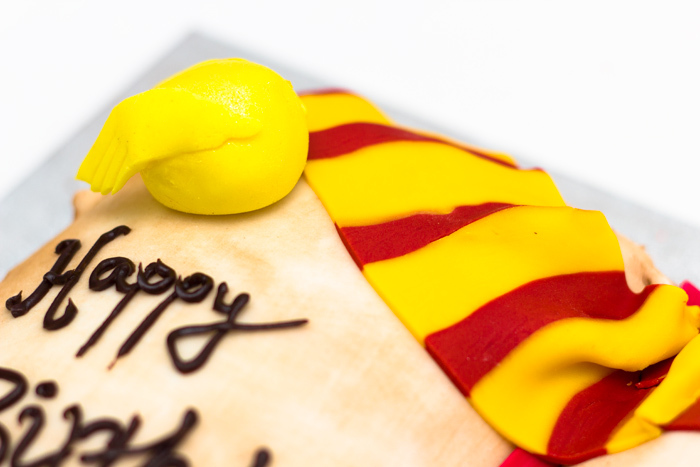 You don’t want to cut through the icing, just make an indent (although the odd cut doesn’t matter). Then brush with cocoa powder to create the definition. I then coloured a small piece of icing red to create a book mark. SCARF: To make the scarf I coloured some fondant icing – half red and half yellow. I cut them up into blocks, laid them next to each other and rolled them out so they joined together. I then cut a long strip to make the scarf shape and cut the frayed pieces into the end before placing onto the cake. WRITING: This is just piped on using a pre bought chocolate writing icing. I squeezed it out of the tube and into a piping bag as this gave me more control. I then piped on the birthday message and thought a spell on the other side would make it obvious that it was a book of spells! When I placed it all together, I have to admit I was pretty pleased with how it turned out! 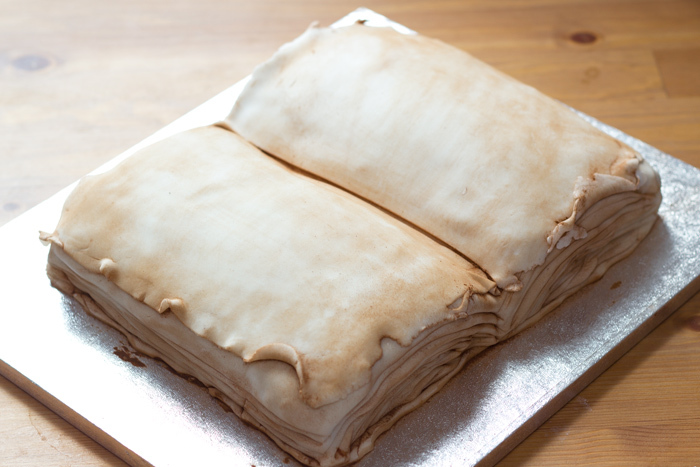 I saw a lot of book cakes on the internet and I was really worried about getting the pages looking right but I think I managed it well. And to be honest, I just did it really quickly as I thought if I did it too slowly and perfectly it would look too neat! 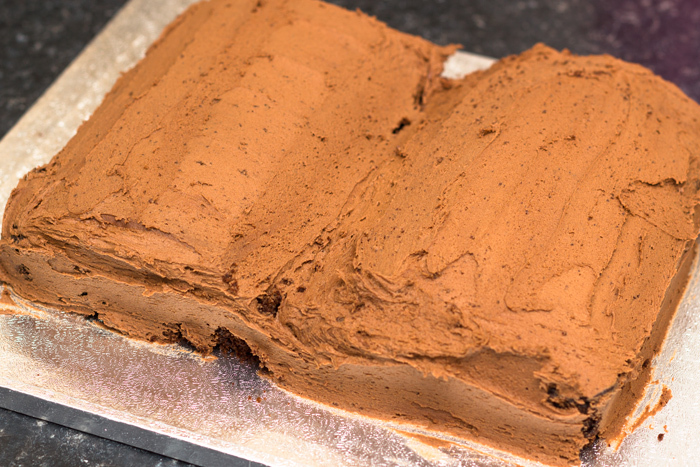 And I used a lot of cocoa powder brushed over the top as this made a big difference to the way it looked. Everyone at the party loved it. I didn’t stay long enough to see what people thought of the taste, but I had a sneaky piece of the cake I carved away so was pretty confident that it tasted ok too! And after all the research, I think I’m now ready to sit down and watch the films! If you try this, let me know how you get on and send me a photo…I’d love to see how it went! amazing!!!!!!!!!!!!!!!!!!!!!!! the snitch is a little golden ball which is one of the most important balls in quiditch, the seeker needs to catch it. when the seeker catchs the ball the team gets 150 points and the game is over!!!!!!!!!! Thank you. I’m sure you can find one! I laid a pretty thick layer of icing over the cake and then made cuts (without going all the way through) to make the pages. And then I rolled out a really think layer to go on top to make it look like a separate page on the top. Does that help? How thick did you roll out the main layer of fondant icing? I’m so glad it helped you! I love your blog – thanks for linking! Just made a book cake for stepsons 8th birthday, used some of your suggestions which worked fantastically thank you for posting! now got to try and do a buttercream HP castle, that looks as good, for the other one (twins)! Oh wow… Good luck! Glad my blog helped you with one of them! This cake is amazing! The pages are impressive! It was a great idea to use cocoa powder, it gives so much definition. Well done! You definitely have to read the books, they are much better than the movies. Thank you very much for all the instructions, I had some problem making the scarf, but it really came out beautifully, my boy was delighted with it, we’ve just come back from the party! I thought the sponge was going to be a bit dry but it really has been very good. I will subscribe to your blog to see what you do. Thanks a lot!! 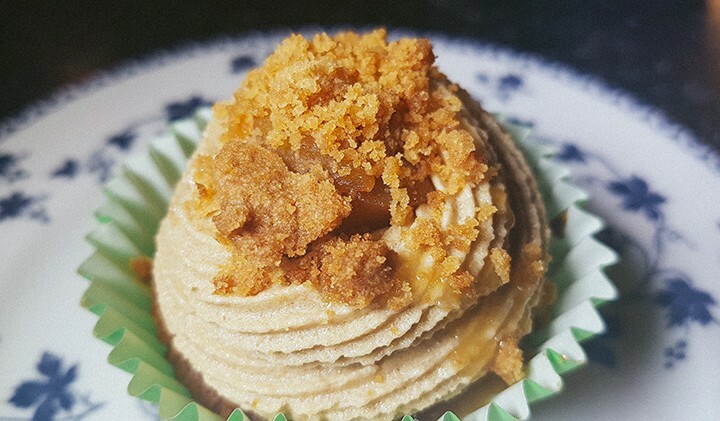 thanks so much for this-I’m in the middle of making one based on your recipe for my daughters’ 7th birthday on Monday. So far the cake is iced, with the pages, scarf, and bookmark done, and the wand and snitch are drying separately to add to it tomorrow when I do the writing. I’d live to share the pics so fare with you-where should I send them? Thank you very much for sharing your instructions and beautiful photos of this impressive cake. I was struggling with ideas and was daunted by my daughter’s request for a Harry Potter cake for her birthday, but you’ve given me confidence and inspiration to plan something similar. Oh I’m so glad it worked for you! I can’t thank you enough for the instructions for this cake. 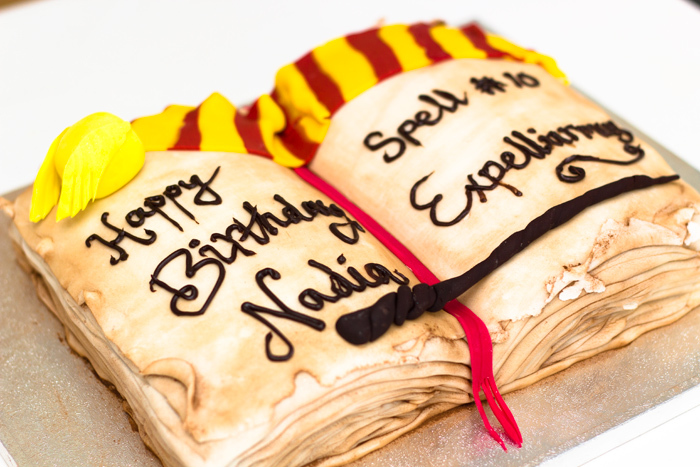 I am about to make it for the third year in a row, my daughter is still Harry Potter mad and only wants this cake again for her birthday. It has turned out amazingly well the last two years, lets hope I can do it again! Thank you! Hi this looks absolutely adorable . I have never worked with fondant before and vandywas thinking of using it only to make the scarf , the snitch and the wand. My question was how much ahead of time can i make these . How do i store them. My daughters bday party is a fortnight away ? Hi! I don’t work with fondant too much so I wouldn’t consider myself an expert. I would say that if you are making them in advance, let them dry out before putting them in a container as they may get a bit sweaty otherwise. If you are intending on taking them off the cake before cutting you can make them whenever you need to, but if you want them to be cut with the cake I wouldn’t make them too far in advance. Hope it goes well! What a great recipe. 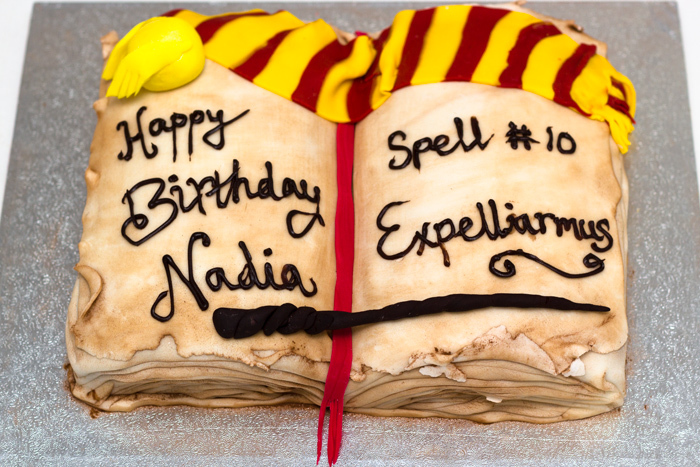 So easy to follow resulting in a cracking cake that my Harry Potter mad nieces will love. Thank you.